Todays modern bikes are some much more reliable than bikes of the pre seventies. From about mid-1985, bike manufacturing technology took a huge leap, and today we have a light bike, that has very capable engine performance, great brakes and suspension. All this without any oil leaks and dodgey electrics. But, if we want to save money, they still need to be maintained. If you have a commuter bike, just for going to work, a weekend road racer or a touring bike, my maintenance courses are for you. Choose from the Road Bike maintenance course, or the full on technical course, which shows you how to adjust valve clearances and do suspension rebuilds. Check for upcoming dates, or better still, email Paul your requirements and he can tailor make a course to suit your needs, either ‘one on one’, or combined into a class. 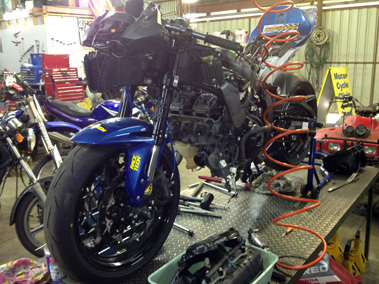 I can also do a maintenance and rider training course ‘one on one’, on the same day.